There are four money markets in the world having interbank offered rate fixings in USD. The USD LIBOR in London is the most recognised and predominant one. LIBOR rates are calculated for 7 maturities, including 1 day, 1 week, 1 month, 2 months, 3 months, 6 and 12 months. allow business and banks to hedge their borrowing interest rate risk because borrowing rates move more in tandem with LIBOR than with the government’s borrowing rate. Exchange (CME) in December, 1981. Futures are exchange-traded, they are standardized and have specified delivery dates, sizes and procedures. Months: Nearest 40 months (i.e., 10 years) in the March Quarterly cycle (Mar, Jun, Sep, Dec) plus the nearest 4 “serial” months not in the March Quarterly cycle. Trading Ends: Second London bank business day before 3rd Wednesday of the contract month. Trading in expiring contracts terminates at 11:00 a.m. London time on the last trading day. Price Quotation: IMM price points: 100 points minus the three-month London interbank offered rate for spot settlement on the 3rd Wednesday of contract month. If LIBOR is 0.64% at maturity of the Eurodollar futures contract, the final futures price will be 100 − 0.64 = 99.36. If current LIBOR is 0.16% over 3 months, by convention, the annualized rate is calculated by multiplying by 4, so the quoted LIBOR rate will be 0.64%. 0.0001/4 × $1 million = $25 or $1 million x (90days / 360 days) x 0.01%. The minimum price fluctuation generally equals one-half basis point or 0.005% or $12.50. However, in the nearby expiring contract month, the minimum price fluctuation is set at one-quarter basis point or 0.0025% equating to $6.25 per contract. Each exchange has an associated clearinghouse. Clearinghouses determine who owes what to whom and perform daily settlement procedures. Because of daily settlement, credit risk is low with futures contracts. Futures contracts pay or collect market value changes as they occur. As a result, after each settlement procedure a futures contract has zero value. Therefore, the side with a gain will be exposed to a relatively small sum in the event the losing counterparty fails to make a mark to market payment. While these contracts mature in March, June, September and December (However, the Exchange also offers “serial” contract months in the four nearby months that do not fall into the March quarterly cycle months.) over the next 10 years, the most liquid mature in the next two years. The table below lists the first few contracts with their expiration dates and prices. Each contract has also its own symbol that consists of “ED” for a 90-day Eurodollar contract, a month (H for March, M for June, U for September, Z for December) and a year. Hence, EDH7 is a 90-day Eurodollar futures contract expiring in March 2017 and has a quote of 99.0850, i.e. 100 – 99.0850 = 0.915% annualized LIBOR rate or 0.22875% over the next 3 months. computing the 90-day rate and multiplying by 91/90. 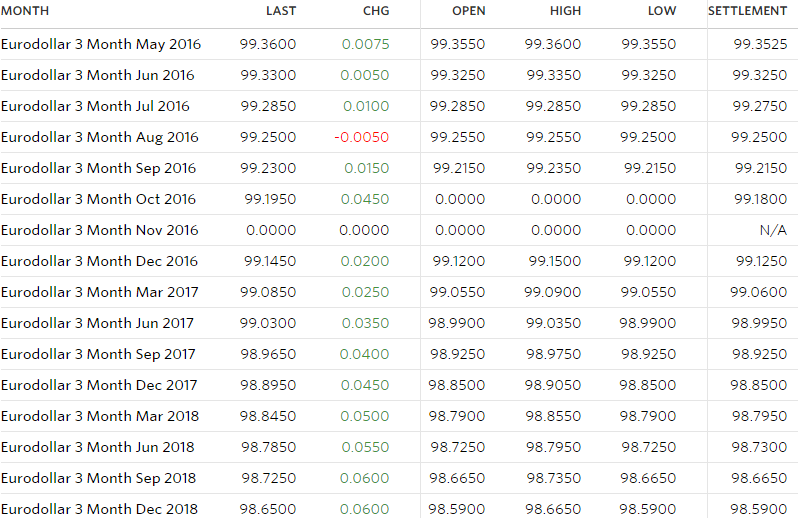 The Eurodollar futures strip (the set of futures prices with different maturities at one point in time) provides interest rate information that is used to price other interest rate derivatives. For example, bootstrapping is a method where the prices of Eurodollars can be used as an input to build interest rate curve. The usefulness of bootstrapping is that using only a few carefully selected zero-coupon products like Eurodollars, it becomes possible to derive par swap rates.